On the Stanley Gibbons Marketplace, there are two ways to search for items - you can either search by keyword, or by country and catalogue number. To search by keyword - enter a word, or words that are specific (or ‘key’) to your search in the search box, for example 'Penny Black'. From here you will be able to sort your search results to best suit your browsing preferences. To find stamps listed by catalogue number, simply include the country name and the catalogue number. 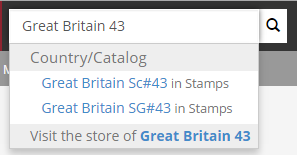 For example, the search below offers you the option to view GB stamps listed with either an SG 43 or Scott 43 in their title listing. To view results for listings that use the SG catalogue number, click on the relevant link (Great Britain SG#43 in Stamps). Please note, if you do not indicate a country, the system will default to the region where you are based. If you select the SG number link, we will display all listings that include SG 43 in their title, in addition, we will provide the corresponding Stanley Gibbons catalogue data.